shubham yadav, 18 Apr 2014How do you feel about the camera and speed of s5 compared to s4 octa. Also tell me about the u... moreFor the camera, in good light condition, I find it pretty similar, with the advantage of having 16/9 at 16MP. The HDR mode is very nice though, since you can see the live preview of the picture that will be taken with HDR, and it's instant now, no more processing. The focus is very fast, so that helps too, and pressing the shutter takes the picture instantly too, which was one of the things that annoyed me with the S4 (I didn't have that problem on the S3 for instance). Low light pictures are quite a bit better, though still not perfect. Videos seem to be of higher quality, especially 4K of course, but even in 1080p. Performance is very very good, it feels like it's flying all the time. I haven't experienced any lag yet, and everything opens quickly. I feel like they concentrated on making Touchwiz lighter, and since there was no resolution bump, the new SOC is far from its limits this time, so it feels much smoother. I do think your S4 will be enough for another year though, it's still a great device even if it's not top of the line anymore, even more with Kit Kat, and there's always the chance of Samsung updating Touchwiz for it..
gsmarena you are being too honest, 30% of the whole world today would pick a media phone over a health tracking finger printed phone,... 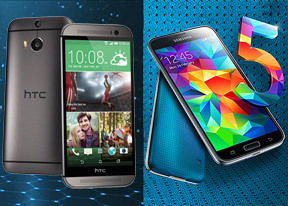 I do think if you want to unique,htc is the way to go but if you want an overpriced life then go samsung,.. I still miss one thing from samsung,something different from their current designs... Premiumness!!! And btw these reviews we read do spoil our desires, gsma,techcrunch,mashable,engadget... All those are different reviewers with different tastes and views. AnonD-255129, 18 Apr 2014Thanks :) I also had a S4 (i9500 octa version) just before the S5, and was very happy with it... moreHow do you feel about the camera and speed of s5 compared to s4 octa. Also tell me about the ui. Hopefully Samsung will update touchwiz on s4 soon. That's the only reason why I am not exchanging my s4 with my father's g2. I am just a college student and hence can't get a new phone every year like you. I have to keep it for another year unless it becomes unusable. One advantage about the octa is that cores wear out slower as they are not on most of the time. The cortex a15 is off for most of the time and hence stays new. That's why I am getting the same performance even after 1 year of heavy use. [deleted post]You should learn to handle the facts. [deleted post]Ok, that joke has gotten so old now. The S5 is not that bad. Haters who havent even used the phone are raging on and on. AnonD-255436, 18 Apr 2014Please feel free to buy the GS5. I bought mine on the day of release and I'm yet to regret it.... moreThanks ! I actually did buy it already (the Snapdragon version though), and I feel the same way as you. I find the actual user experience a lot better! Pls can anyone tell me if you can stream music and video wirelessly to ur tv and game consoles from the samsung galaxy s5 as I just seen that it has no dlna . I also had a S4 (i9500 octa version) just before the S5, and was very happy with it. Kit Kat helped a lot in improving the lags and general performance indeed. I'm very happy with the jump to the S5 though. Hopefully they will update Touchwiz on the S4 in a later update, that would be nice. I checked at the store the s5 and there is still lag when you are using the phone. Just go to a store and play with it and you will see or check youtube for s5 gaming lag or MKBHD review. This is unacceptable for a 2014 flagship. Friends of mine have the z1 compact and iphone 5s and I played with them and there is no lag, even if the specs are worse. Furthermore, the settings are very confusing and the messaging, contacts and email stock apps look very outdated compared to other phones. They are mainly apps with a plain black background and white letters with minimum graphics, just bland. Finally, the back cover of the white and black s5s that I saw looks better than the glossy back cover of s4, but the overall design looks a lot like a bigger s2 or a Galaxy Grand. Neutral, 18 Apr 2014Tried s5 yesterday and still lack. Samsung is still famous with fake test and announcement . W... moreBetter language use may make us take your comment more seriously. Anonymous, 18 Apr 2014Samsung think they can sell plastic phones at iphone prices.And they do. Every year. Millions of them. And people buy them. Every year. Millions of them. What happened to my comment? I pointed out leather and steel is misleading and wrong. Both are neigher leather nor steel. S5 uses polycarbonate plastic while M8 uses space grade aluminium. AnonD-255129, 18 Apr 2014It's very nice for you if you like your phone, but some people have different tastes than you ... moreThe best comment in the whole thread. Really man, you really have an unbiased opinion. You didn't uselessly bash any of the phone. I won't take any of these but I am just interested in tech knowledge. This is the second best place after samsung vs apple fanboy fight where you find such level of baseless fanboyish arguments. It feels great that there are such people still left on this planet and the situation is not completely hopeless. Hope that your s5 serves you well for the foreseeable future. I myself own an s4( octa) and happy with it( especially after kitkat) for atleast an year. These kind of phones make me greedy. The new touchwiz looks enticing. Also the battery life of both the phones is fantastic. It also helps with not being so afraid to use it in the rain or to put the phone next to a glass of water. About the screen, if you even read the article, you might have noticed that the S5 can now display natural colors as well, and also caught up to the LCD in terms of brightness.. so there goes your argument..
About the UI.. Touchwiz is a lot lighter and smoother than the previous versions. There is a lot less bloatware, it's completely lag free and extremely fast. I haven't tried Sense 6 so I will not do pointless comparisons without knowing like you seem to enjoy doing. Design and Build Quality : read my previous post about it.. stop confusing build quality and build materials, those are 2 very different things. Just buy the phone you like and stop trying to bash the other phone with baseless arguments, it only makes you look like you're trying to convince yourself you made the right choice because you're not so sure anymore. felfel, 18 Apr 2014m8 for life.. who care about finger print and water dust..only advertising tools like xperia ... moreS5 has a better camera, but M8 has the better looks. n my opinion, M8 with wireless charging would be my choice. Probably still going to buy it, not sure so I'll wait for a couple of months and decide then. Hopefully the Z2 is out then, too! Sorry for your whole argument, but the S5 is actually better than the M8 in low light as well this time.. I've done some tests as well to compare with my S4, and it's a lot better indeed. AnonD-237024, 18 Apr 2014Browsing through the comments, the S5 is getting a lot of favouritism. I would prefer the HTC ... moreI agree with you on the fact that at the end of the day, to each his own..
"And Sense 6 has less bloatware than the S5 (which takes up a majority of the storage)". If you were comparing with the S4, then I agree completely, but not anymore. Instead of 8.7GB usable on a 16GB S4, I know have almost 12GB usable on a 16GB S5.. There is a lot less bloat than before, most of it is now freely downloadable from the Samsung app store and not pre-installed. Touchwiz is a lot lighter than before, and it shows. Also, to those people who are arguing abou the tie for Design & Build Quality. This category is not only about looks or materials used (which is mostly based on opinions), but about design choice and actually build quality (not materials). Build quality seems better on the S5, based on various tests I found (try to put a M8 in the washing machine running for 50 minutes, I'm not sure it'll be as intact as the S5.. or you could try running over it with a SUV). The water/dust resistance also gives some points to the S5. who care about finger print and water dust..only advertising tools like xperia z and in use its failed cus no need to them like before..
ips3 has more natural and clearest color than super amould. sense6 is more smoother and freasher than touchwiz with a lot of lags like s4..
about design -build quality and premium feel then all its clear. Most people will disable the fingerprint scanner on the Galaxy S5 because its not half as good and convinient as the one on the iphone 5S,also how many people can make any reasonable use of the heart rate monitor on the S5?.